Meet the new year, same as the old year, as Pete Townshend might have said. New Year's never been much of a thing round our house. Seasons change and so does the weather but resolutions and predictions don't figure much. Still and all it's as good a time to reflect as any and it's always fun to speculate, so away we go. 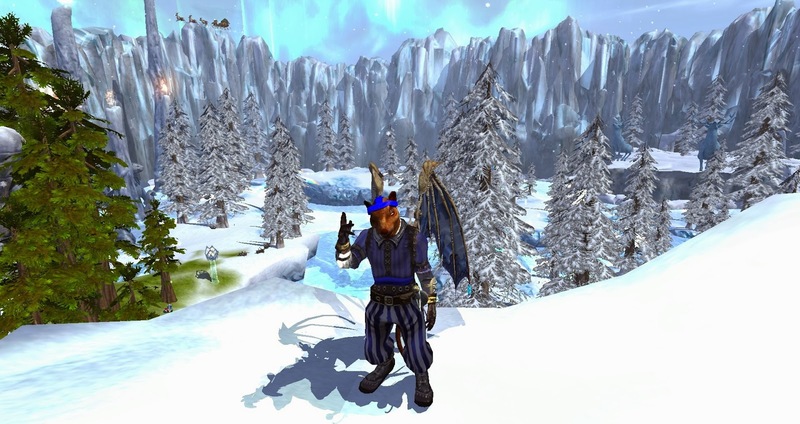 As many have observed already, 2013 was something of a mark-time year for MMOs. The biggest event of the year was either Neverwinter or the re-launch of FFXIV. When the best the genre has to offer is a choice between the latest project on the Perfect World/Cryptic assembly line and the second coming of a game that failed hard the first time round it would be tough to claim we'd had a vintage year. That said, a lot of people seemed rather to enjoy Neverwinter although they often seemed to be admitting to something of a guilty pleasure whereas FFXIV: A Realm Reborn, to give it its full, unwieldy title, generally received the warm, if bemused, reception accorded to an old dog as it unexpectedly manages to learn a new trick. That the FFXIV revival was done so well did surprise people but nowhere near so much as that it was done at all. For me, Neverwinter turned out to be one of those games that I like in theory but never get around to playing very much and now that it's decided not to run at all on my PC even the theory part is, well, theoretical. FFXIV I liked a lot and played a lot, for a while, but the combination of extreme alt-unfriendliness and subscription payment model did for any plans I might have entertained for playing it long-term. The biggest new story of the year, in my opinion at least, was the combined EQNext/Landmark reveal at last summer's SOE Live. For a couple of weeks that seemed to be just about all anyone was talking about. More surprisingly Sony just about managed to keep the buzz going for rest of the year with a seemingly inexhaustible series of pointless polls and uncomfortable videos. As I explained, while I think I'm relatively clear on what to expect from EQNext (nothing this year for a start) but I'm still not much wiser as to what Landmark actually is. The time is fast approaching when all will be revealed. According to Smed alpha should start sometime in January. Will I be there? 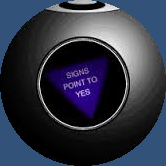 The Magic 8-Ball knows. Other than that, 2013 was all about GW2. It's an odd game. In some ways it turned out to be nothing like most people expected or ArenaNet claimed. With amazing sleight-of-hand ANet contrived to replace the usual vertical end-game gear grind progression with a similarly exhausting version based on crafting, while at the same time converting the hitherto sprawling, cyclical, unruly open world into a tidy, manageable sequence of numbered and packaged limited-duration events. The promised flat leveling and horizontal progression elements still exist but have deftly been rendered almost entirely irrelevant. A remarkable achievement. While the entire game was being re-purposed around us, however, one of the original articles of faith at which many, myself included, had scoffed turned out to be no more than simple truth. It had been claimed before launch that World vs World vs World would provide all the endgame that was needed and after a coughing, stuttering start so it proved. The part of the game I never expected to pay any mind to has become, over these last few months, almost the entirety of my concern. I'm not saying I like that. Indeed I may be saying I don't like it much at all. But it's a fact. Of course there were other MMOs, foremost among them EQ2, with whose expansion before last I finally caught up and whose current expansion I am just about ready to begin to explore. Then there was City of Steam, which came badly off the rails before righting itself after a fashion and carrying on along a new track altogether. I rode herd on dinosaurs in DinoStorm, jetpacked around Firefall, snuck back into The Secret World and even revisited World of Warcraft. I thought, often, about Getting Something Done in Everquest and Vanguard but rarely did. And so it goes. 2013, the Year of More Of The Same. A comfortable year. Not much got done but by and large I had fun not doing it. What about 2014? Are we stuck in this cosy little rut for another twelvemonth? You know, I rather fear we may be. The prospects for 2014 look uninspiring. I imagine the Big Three on the watch list of most Western MMO fans would be WildStar, TESO and EQLandmark. TESO, on the other hand, looks set to disappoint just about everyone. I don't have any residual affection for the IP so if it ends up appealing to me even in the slightest I'll be both surprised and delighted. Plenty of other people, however, are very heavily invested indeed and when an MMO gets made from an IP that people love it doesn't often seem to go down as well as either the developers or the fans might hope or expect. 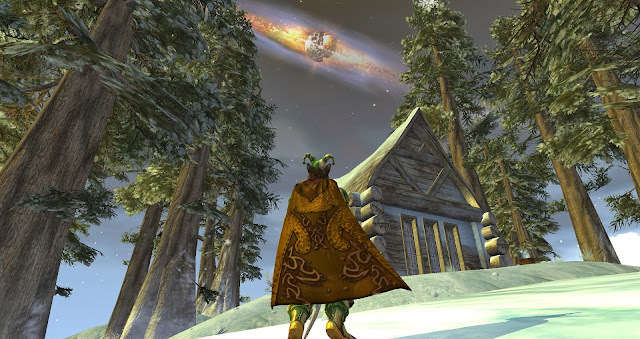 LotRO might be the exception although even that's had its ups and downs, but the commercial and/or artistic history of the rest - SWG, SW:ToR, Warhammer, AoC, STO, DDO, Lego Universe, to name just a few of the better-known - well, it doesn't make pretty reading. 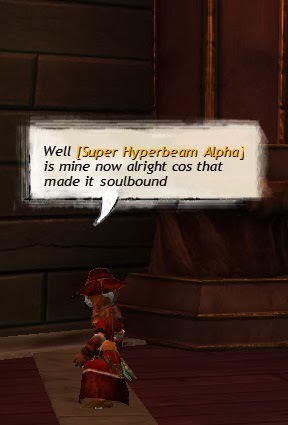 WildStar, being an original property, should at least avoid disparaging comparisons to its source material. Instead it risks the usual fate of would-be mainstream themepark MMO launches of latter years - being largely ignored by most of the audience it would like to attract while at the same time drawing unflattering comparisons with established titles from those who do give it a try. Nevertheless, while WildStar doesn't hold much interest for me, I wouldn't be that surprised to see it making the best showing of these three in 2014, at least until something better comes along. It smacks rather of Rift, a clean, well-designed MMO from a commercially-focused and adept team with a lower megalomania co-efficient than the average MMO development House. So WildStar's my horse in this three-way race. I'll back it but I don't plan on riding it. Most likely I'll spend much of next year hacking around the same familiar landscapes on the same spavined, slouch-backed old nags or bumbling around Landmark with my eyes on the horizon and the distant promise of EQNext. Oh come on! Let's not be negative! Perhaps Landmark will surprise us all when its really A Thing. Maybe the climax of GW2's year-long Living Story will blow our socks off and leave us cheering for the next installment. Maybe something none of us has yet heard of will roar in out of left-field and bowl us all over. Or maybe 2014 will just be The Year Of More Of More Of The Same. Could be worse. Freeport was never the most relaxing shore-leave you could find but the current crisis makes even the pending anarchy of Lucan's sabbatical, a time when you could get kicked in the backside by a self-appointed "guard" just for having the temerity to walk down the cobbled street from The Jade Tiger to the docks, feel like the Glory Days. There are dragons circling the city, breathing fire in that disconcerting way that dragons have when they want to let you know they're ticked. Doubting The Overlord is a criminal offense, Citizen. I'm a tad vague on how they came to be there or what Lucan might have done to upset them but whatever it was Our Overlord has the mages of the Academy of Arcane Science working overtime maintaining a protective dome over the entire town lest the dragons burn it to the ground. It's putting quite a damper on the Frostfell festivities, I can tell you. As a Freeportian in good standing with the citizenship papers to prove it, my Berserker has every confidence in Lucan's capacity to handle a few dozen dragons. Some of the sniveling common-folk whimpering in the streets and alleyways aren't showing the unquestioning loyalty to the Overlord they should, although of course, they don't have all their valuables safely stashed in a mansion in Maj'Dul like some forward-thinking rats do, but still...we must have faith! The Overlord Will Prevail! It so happened that when my Berserker finished helping his Othmir pals get settled into their new, undead-Ulthork-free home in Cobalt Scar the bags and boxes he lugs around to carry the vast amount of stuff he seems to acquire everywhere he goes were full to bursting. (Seriously, what kind of refugees hand out dining-room furniture for favors done anyway?). He'd been on a killing spree for what seemed like weeks and he seriously needed a clear-out, not to mention his armor needed a good scrub down and re-oiling, which is how he came to be back in good old Freeport in the first place. Dismissing all concern of imminent draconic destruction, he was rummaging through his bags at the counter of the Freeport Bank, when he came across a strangely-marked hide. So much had happened of late with scarcely a minute to stop and reflect that he'd forgotten all about the strange, shadowy creatures that attacked him, first in Cobalt Scar and later in Great Divide. He'd just shoved the odd skin he'd found into his packs to examine more closely later. Well, now it was later. And that was how it all began. A close examination of the hide revealed a brand unlike any he'd seen before. Thinking it through he recalled an old acquaintance from his younger days, Grim Stormshield, sometimes referred to as the Nesingwary of Norrath, although not to his face. Last seen, Stormshield used to hang out in an isolated camp in the Jarsath Wastes. Jarsath Wastes never used to be the easiest place to get to, which is why it was always worth making the considerable effort to acquire the Fabled Worker Sledgemallet. Even once there it was a fair old trek out to Stormshield's camp. Those days are long gone, it seems. Rather than whacking hapless wildlife in the Commonlands in the hope of a proc, nowadays it's a quick ding on the World Bell and there you are on the Danak Shipyard docks. 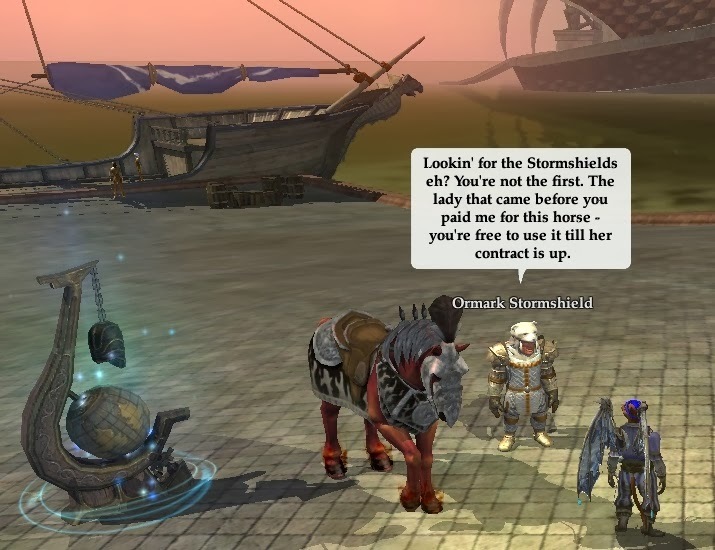 What's more, Ormark Stormshield is standing right there with a rent-a-horse trained to go straight to his brother and there's still paid time on the clock from a previous customer that he's happy to let you use. Now that's what I call timing. And that's how it went. I found myself involved in a quest that I wasn't expecting, that I'd acquired by happenstance and that I was following out of pure, natural curiosity. Each step followed neatly and logically from the preceding one, requiring a good deal of travel but providing just the right options to make the journey a pleasant run out rather than a painful slog. The winding path took me from Jarsath Wastes back to Freeport then on to Somborne Village in the Loping Plains, to a secret lair beneath the Nektulos Forest shore, into the formless void of a Spiritual Wound and under the sea to a sunken cave off the Butcherblock coast. There was a lot of overwrought, overwritten metaphysical maundering and plenty of punch-ups. At no point did I really know what I was doing or why and it was great! All the while I was trying to guess what the purpose of the quest might be. Was it a lead-in to the new expansion? Maybe, but it didn't seem to have much to do with dragons. Was it a Heritage Quest? Possibly, but I couldn't think what ancient Everquest item it might be. Could it be a Holiday Event? Didn't seem very seasonal. That sound you hear? It's a penny dropping. Not knowing why I was doing this long sequence of tasks made each step all the more fascinating. It felt like a throwback to how questing in Norrath used to be, only with the good parts - the mystery, the speculation, the curiosity - left in and the bad parts - the tedium, the dead-ends, the massive xp loss - left out. Of course, at any time I could have googled to find out what was going on but the whole thing flowed so smoothly it literally never occurred to me. I generally only look up quest walkthroughs when I get stuck or frustrated and that never happened. It wasn't until about three-quarters of the way through that I began to get an inkling that what I was doing might be related to the new class that was added with the Tears of Veeshan expansion but I still wasn't sure until I reached the very end and received my Arrow of Spirit. a Channeler or whether it's just some lore and flavor to get you in the mood. I don't even especially want to play a Channeler. Or I didn't, before this. Now I think I just might. This is what questing used to be like before it got a bad name, isn't it? Alright, probably not. It's what I'd like it to be like from now on, though. No More Sleeps 'Til Christmas! Another day, another Landmark video. And what, if anything, can we infer from that? Well, it seems we need the "huge", "giant" world because "there always needs to be something for people to go explore through" and it has to be procedurally generated because if they'd handcrafted it they way they did Everquest and EQ2 "it would just take way too long and people would consume that content long before we could create more of it". Hmmm. So do we conclude that the "content" of Landmark is territory and that the act of exploring said territory will consume it? Is that consistent with the emphasis previous videos gave to building and creating? Is there any need for a vast world to explore if the main thrust of the game is building structures, which almost by definition tend to remain where you put them? a) The game is called "Landmark"
c) The premium pre-release Pack offers as one of the highlights "a 48 hour or more headstart into Open Beta ensuring ... time to find amazing new claims". 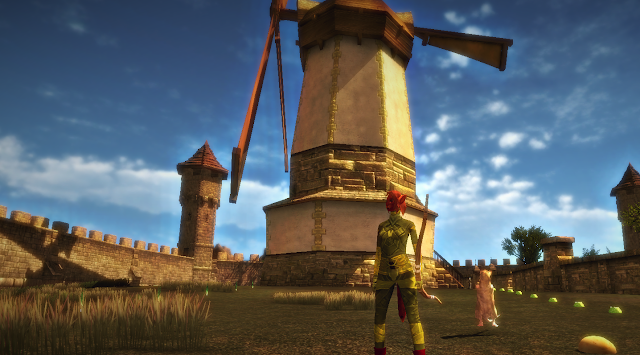 d) By the time Landmark officially launches it should include combat, achievements, titles and an economy. A pure MMO Construction Set presumably wouldn't need "content" or gameplay at all, so this must be a game first and a construction set only incidentally, unless, like Neverwinter Nights, the Game and Toolset parts come separately, something that hasn't been suggested. Yet. Not just a game either but one with a competitive element. I'm having trouble not thinking of it as a corporate version of Wurm Online, which is an intriguing, if slightly terrifying image. Also, wasn't the idea that we could build anything we fancied, not just things that might exist in Norrath? I seem to remember there being something about a SciFi setting and maybe a contemporary one. Did I imagine that, because if not, don't these five environments offer a somewhat limited palette? 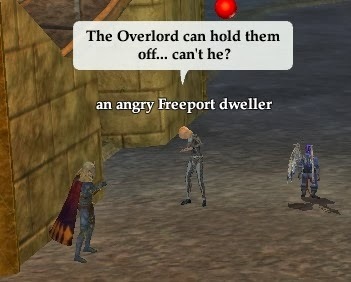 Or are they purely for the "Only In Norrath" segment that feeds into EQNext? That would at least explain the constant referring back to pre-existing Everquest zones. It seems the more they tell us about Landmark, the less clear it becomes what exactly it is, which makes it somewhat difficult to decide whether to spend $20, $60 or $100 or just pass on the whole thing until the finished version arrives for free. I haven't stumped up for any of the Founder's Packs yet but the time for getting down off the fence is fast approaching. John Smedley is now suggesting a mid-late January start for Alpha rather than the end of February. 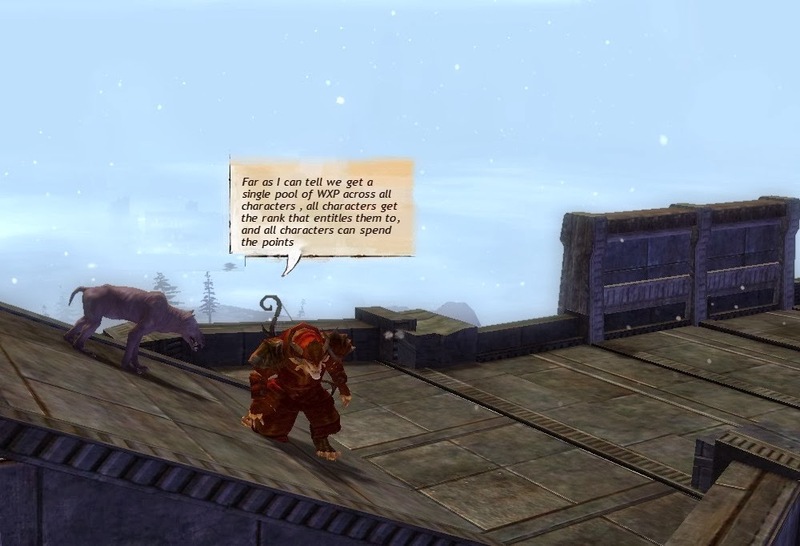 The Cobalt Scar main quest sequence, like the Ethernere timeline from the Chains of Eternity expansion, is a long one. Long, but very enjoyable. It benefits enormously from the strong nostalgic affection many longtime Everquest players must have for the original zone that inspired it. Alright, that I have for it, then. 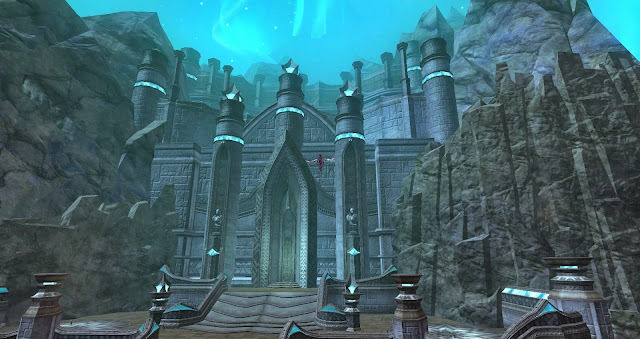 The nostalgia factor comes through very strongly even though in most respects the EQ2 version is scarcely recognizable as the same place. About the only thing that remains unchanged is the crescent shape of the water, water which, it transpires, (Spoiler Alert!) is no longer an ocean at all but a large lake. Indeed the entire zone now has the feeling of someplace halfway up an Alp, with great swathes of nordic pine forest covering half the map and bears and stags roaming all over. It reminds me a lot of Timberline Falls, one of my favorite Tyrian landscapes. Hey, I've got one of these at home! Smaller, and his head goes round and round. Missing, and much missed, is the crazed musical score that so enlivened every day, and there were many, that we spent among the Othmir. I still whistle that tune at work now and again. The otter men themselves are there in force but no longer are they the jolly top-hat wearing comedy figures (and perpetual murder victims, although never at my hand) that once they were. Now, in keeping with the grimmer mood that seems to prevail in almost every imaginary online world, they are desperate, driven refugees, harried on all sides by forces they don't understand and cannot hope to defeat. Well, not until I come along to sort it all out for them, as usual. If we had a bridge we could play Pooh Sticks. Oh, sorry.. Funeral. It's a pretty decent plot, too, as these things go. It certainly makes more sense than the Ethernere one, sticking to a much more down-to-earth mystery model than that confusing metaphysical mash-up. Actually, it's two mysteries. The Case of the Undead Othmir is solved but the Enigma of the Eerie Encampment remains just that - an enigma. Maybe I missed a step. Along the way I got to participate in an Othmir funeral (they send the dead back to Prexus on rafts, Viking style, although without setting anything on fire), got turned into an Othmir (the nearest we'll ever get to having them as a playable race, sadly) and listened to foliage reliving the past (as exciting as it sounds). Ulthork Man-O-War. Can't go wrong with a Classic. I also had to kill about a hundred thousand bazillion things. The current design brief for EQ2 zones appears to be "Hey, you left a square foot of grass free over there! Put a mob on it! No, wait. Make it three!"). For every Kill Ten Ulthork quest (yes, there are Ulthorks, although no Bulthar that I saw) I'd estimate I ended up killing twenty. Often more. There wasn't any quest that I ever found to kill wasps but I killed dozens of them trying to get to the bears. And forget any thought of flying over all this stuff to avoid it - Cobalt Scar airspace is jealously guarded by flying snakes, drakes and plain old hawks. I'm the one in the fancy hat. For all that killing, and there was enough of it that my mouse finger was aching long before the end of every session, experience moved like treacle going uphill. With the entire timeline completed as far as the last segment that will take him into Siren's Grotto my Berserker stands at 93.65. With luck and a following wind Siren's Grotto and Frostfell should take him to 94, at which point I'm hoping he'll be ready to start on the real current content. He certainly couldn't do it at 93. That means back to the Ethernere for a cruise around the Vespyr Isles. And after that I imagine both he and I will be ready for a lie down. A brief reference in a recent post by HarbingerZero was the first I'd heard of Project: Gorgon. Probably. I don't know...I might have seen the name before somewhere, I guess. So many indie sandboxes - it's hard to remember them all. Probably wouldn't have noticed it this time either had HZ not bundled it in with the much-missed Dawntide. I played a fair bit of Dawntide in its various incarnations. It was one of the buggiest attempts at an MMO that I've ever come across, although the bugs often didn't get in the way too much because most days the extreme lag made the whole thing unplayable anyway. Even when it did run, for the longest time there was next to nothing to do but walk around looking at the scenery. At the pace of a tortoise. A tortoise with a broken leg. Later, when there were things to do - fighting, crafting, trading, complicated, innovative stuff like that - the implementations were some of the slowest and most cumbersome I have ever seen. You can pack that in. You've had all the cheese you're getting. And yet it had something. I must have put in several dozen hours on and off over a couple of years. I'd play, get frustrated, leave it for a while and then catch sight of the icon on my desktop and wonder... Then back I'd go for another few sessions until the pointless futility drove me to question my judgment and my sanity all over again. Eventually the funding ran out, or the developers' patience, or both and development on Dawntide stalled then ended. Finally it closed down thereby saving me from myself. Until now. Always keen to demonstrate that I learn nothing from experience, I went straight from HarbingerZero's link to the Project: Gorgon website. In what seemed like less than a minute I was in the game. Barriers to entry? Never heard of 'em. Didn't need to register, give my name, email, nothing. I can breathe! I can breathe!! Like all too many MMOs, indie and mainstream alike, it starts in a cave. And your character's a blank slate with no memory of a former life. Could it possibly be worth carrying on after an opening like that? Well, yes it could. For a start the controls are easy, intuitive and they work. That puts it about five ranks up on Dawntide already. And there's lots to do right from the start. NPCs to talk to, skeletons to fight, puzzles to solve, chests to open, mushrooms to pick. (Bit of a Thing in P:G, mushrooms are, or so it turns out. But let's not get ahead of ourselves). The sandbox approach is plain from the get-go. The cave is a tutorial of sorts, so there are plenty of hints, suggestions and advice, but it's very clear that what you do and how or when you do it is down to you, matey. You can use all the weapons, learn all the skills, be whoever or whatever you want to be. Just don't come crying to us if you hurt yourself, or turn yourself into a cow. Forever. I was ready to risk a cowing if only I could get out of that cave. I'd been in there for a couple of hours, found some very unsavory used clothing that was nonetheless an improvement on the soiled underwear I'd started out in, found some cheese and used it to learn to tame rats. 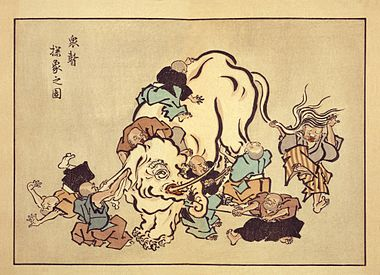 I had one of the oversized variety following me about like a dog, which would have looked odd enough even if I hadn't chosen to be a Rakshasa, which is basically a cat standing on its hind legs. The rat and the cat, we had some adventures but when the cat saw the glowy blue portal to the outdoor world and the rat couldn't follow she dropped him like *that*. Cheese to spare and rats come cheap and easy. Soon find another. So out I stepped from the dark (if occasionally psychedelically-illuminated by weird crystal formations and borderline radioactive fungi) tunnels into blinding sunlight. 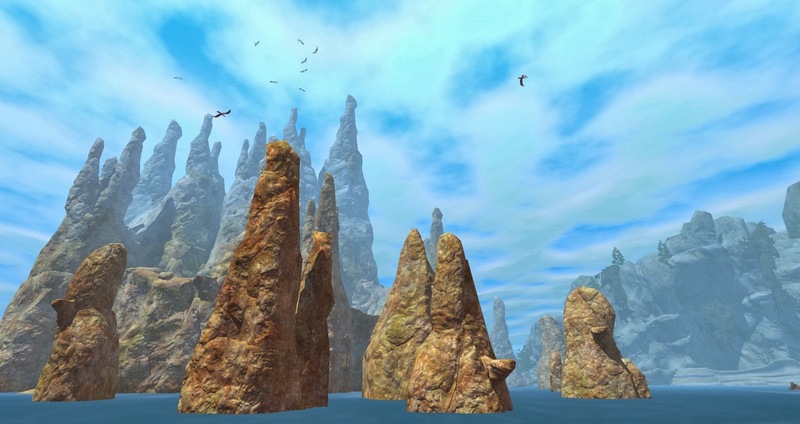 Maybe it's just me but if I was trying to entice people to come play my sandbox MMO and I was able to make landscapes as entrancing and visually appealing as this, even in my pre-alpha days, I think I'd start people off right there. Not in a cave! The very first view as I emerged, blinking, from the portal was stunning. The walled, medieval village is one of the best I've seen in a game as far as spurious authenticity goes. I've been in that village several times, in France, in Spain, in Portugal. I think there's one like it about 30 miles West of where I'm sitting typing this. Maybe someone's using photo-reference. Whatever, it convinced me I was "somewhere" and that's most of the battle won right there. Are we in The Cotswolds? From then on it's mostly been wandering about. The explorable area is relatively small, I think, although it's hard to be sure. Foot travel is on the slower end of the spectrum and by the time I'd run far enough in one direction to come up against an invisible barrier in the hills surrounding town I wasn't inclined to go check every other cardinal point for breaches. Just because my back's turned doesn't mean I don't see you eying up my potato, rat. So Project: Gorgon really isn't like Dawntide at all. There's no lag, plenty to do and most of it works. The light changes, the shadows lengthen, the birds sing and when you raise a skill fireworks go off and a bell chimes. For a pre-Alpha it looks in pretty good shape. Before I logged out this time I did what they hadn't made me do to begin with - I registered an account. You can do it right there from inside the game. I did it because it ensures my character will still be around next time. And there will be a next time, because in one very important way Project: Gorgon is like Dawntide: it has potential. Someone at SOE is on a roll. 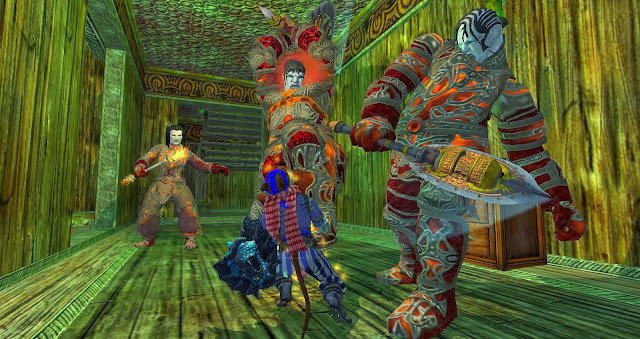 For Halloween they came up with what was quite possibly the best small prestige house in EQ2 history - Fright Manor. 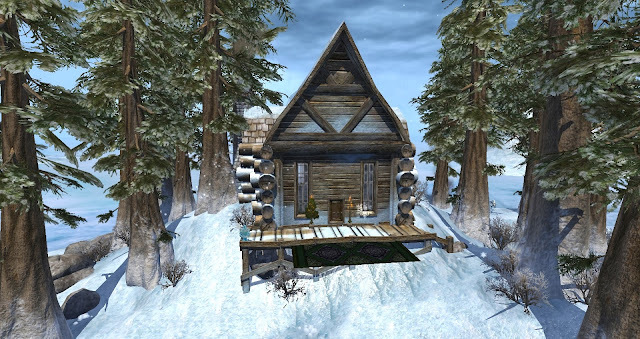 Now for Frostfell they've surpassed even that exemplary standard with a positively Platonic Ideal of a winter retreat. For years I've been piling up Station Cash for no better reason than "it might come in handy some day". Now that day has come. Two houses bought in two months. Carry on like this and I'll be SC broke in under a year! The deed on the generically named "Snowy Dwelling" (seriously, for something this gorgeous, that's the best name you could come up with?) comes with a price tag of 1350SC. That's $13.50 at face value but it's probably closer to $5.00 at the exchange rate that prevailed when I last topped up my imaginary money pit. That was back in the glory days before someone at Sony's Accounting Dept. paid a visit to San Diego and put the kibosh on all those Double and Treble SC sales. Even at full price it would be one hell of a bargain. Not only do you get a beyond-charming log cabin, surrounded by mature pines and set on its own private island, you also take freehold on a large swathe of the surrounding ocean both above and below the waterline, including several ice floe archipelagos. Everything's fully enabled: you can swim in the water, you can fly through the sky (assuming you can fly in the first place, of course). 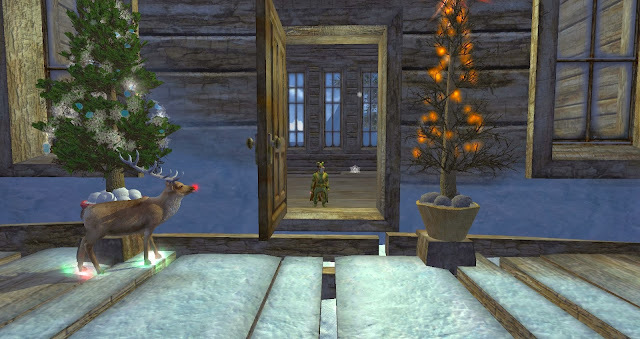 It's your own personal Winter Wonderland and it feels bigger than Norrath's actual holiday zone itself, Frostfell Wonderland Village. The Greening of Frostfell. I smell elf. Talking of The Village, it recently underwent a very successful and welcome facelift during which not only did the invisible decorator elves (the best kind) polish the ice, plump up the snowdrifts and repaint the rainbow bridges, they somehow managed to drag up a whole new mountain. 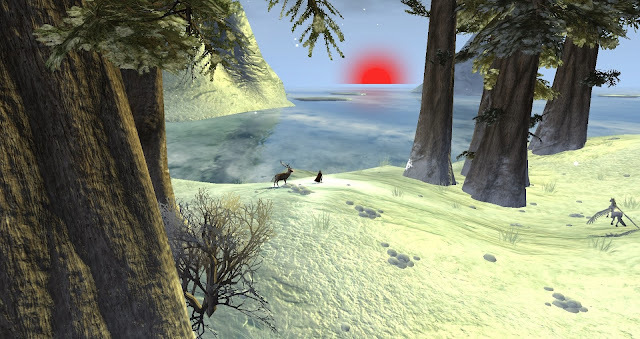 Add that to the considerable visual pleasures of the Ethernere and the very convincing "Spring Meets Winter at Tundra's Edge" atmosphere of the recently-added Velious zone Cobalt Scar and it would seem that EQ2's artists and zone designers have turned something of a corner. Maybe it's new blood in the art department. Maybe it's the same old bloods feeling the hot breath of the Landmark crew on the backs of their necks. Maybe they just have better tools to work with nowadays. 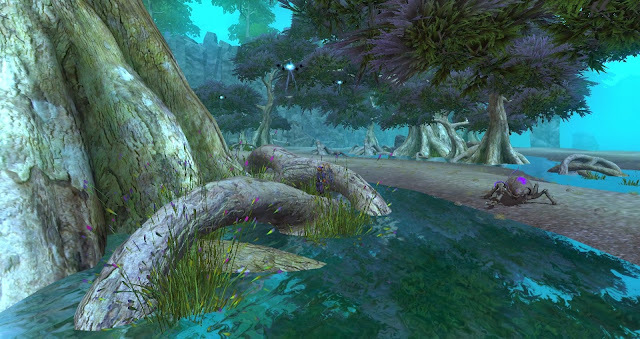 Whatever it is, EQ2 has never looked better. Not your grandmother's Cobalt Scar, that's for sure. So my Beastlord has a log cabin with enough stable room for a few dozen warders, provided they don't mind a few inches of snow on their backs. Like my Necromancer before him, now he just needs to decorate. But where to start? There's so much potential, what with the church-high ceiling, the exposed beams and the massive basement. So much potential and so much work. Just getting the carpets laid and finding a bed took the best part of an hour. Still and all, it'll be good practice for Landmark. If I can't commit to decorating one single-room cabin I can hardly expect to make much of a go of a game dedicated to the building of worlds now, can I? This winter and the spring that follows look set to be all about building and decorating. I suppose they always did, inasmuch as I'd expected to be decorating in Eorzea around now, with FFXIV's promised housing patch due to land just before Christmas. Then Square announced that housing would be for Free Companies only for the foreseeable future and that even if personal housing ever did arrive it might only be in the form of rented rooms within Free Company halls and that went most of the way to killing any interest I had in setting up home in FFXIV. The recent revelation of the truly insane pricing structure only delivered the final death blow. When it comes to payment models for MMOs I'm no zealot. I'll pay my sub or buy in the cash shop as required provided I'm enjoying myself. When it comes to a choice between paying a monthly fee to grind repetitive in-game content for hundreds of hours to save up sufficient imaginary money to buy an imaginary house or just getting out my credit card and handing over the earnings from just an hour or two of real-life work...well, there's no choice, is there? Calm down! It's not a giant reindeer coming to get you. It's just the sunrise. 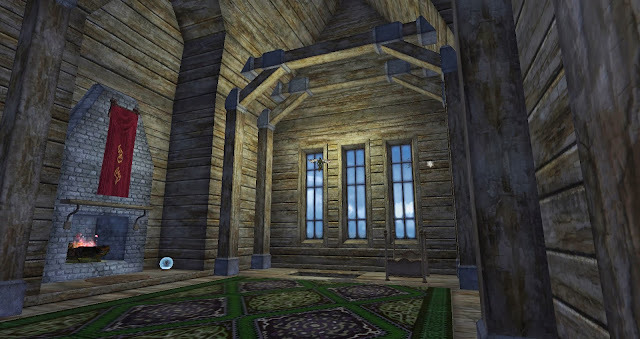 Today, in Norrath, I decided to have a cabin in the woods. Today I have a cabin in the woods in Norrath. Now I get to spend many fun hours in-game crafting, questing, buying and trading for things for my house, followed by many more fun hours making the old place look like home. If I'd decided today to get a tiny house the size of an inn room in Eorzea, I guess if I did nothing else but grind the gil I might have one by, ooh, this time next year. Provided I had a few friends willing to give up their free time and throw their cash in the pool too. I think I'll stay where I am. I know where I'm well-off. Jeromai has an excellent post up about the change of pace that comes with GW2's latest Living Story update. Ravious agrees, as do I. If only we could believe it comes from a deliberate revision of policy rather than just a felicitous gift from the holiday season. The Living Story itself, or its "first season" at least, now has an end date. It's all laid out in this official memo. There are four more releases to come, the next not arriving until January 21st. Assuming the traditional two-week drop rate that puts the "epic finale" on March 4th 2014, meaning the inaugural story-arc that began so limply with a few dazed refugees stumbling through the Shiverpeak snows will have occupied our time for well over a year. All discussion of the merits and methods of the Living Story process seems to have been subverted and overtaken by negative reaction to Scarlet, the storyline's hugely controversial central character and star villain. If ArenaNet set out to create someone we'd love to hate, well they got it half right. 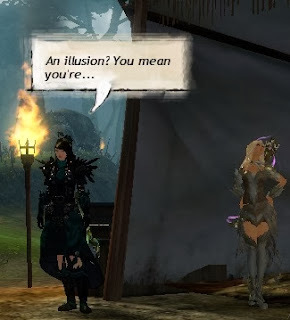 Focusing on Scarlet's many flaws risks letting ANet off the hook for the more serious, structural problems that have sometimes tended to make playing GW2 this year an enervating activity. It's a feeling that surely underpins our sense of relief as we come into Wintersday with the prospect of six whole weeks to get stuff done before it all kicks off once more. Much has been made of the lack of effective tools for carrying a story in the first place. The decision not just to make a questless MMO but to make the very fact that it has no quests one of its unique selling points looks ill-advised when only a few months after launch you choose to re-focus your entire game around a single, extended narrative. A heroic effort has been made to use just about every in-game system to share the load - mail, achievements, dynamic events, incidental dialog, personal instances, cut-scenes - you name it, they've tried it. In the end the main thing all that hard work has served to do is emphasize how useful a framework the MMO quest is and why game developers created it in the first place. Over time the handling of the tools and the way information is disseminated through them has very clearly improved. That and we've become used to to it. It feels rather like driving a beat-up old car, the door handles replaced with string, a tinny transistor radio balanced on the dashboard, the exhaust pipe patched with a Coke can; it's not pretty, it's not always comfortable but it's familiar and it gets you where you need to go. Some parts do shine. There have been some impressive cut scenes. The team working on those should feel pretty pleased and proud with their work for the year. Indeed the visual elements have all been impressive, with the Bazaar of the Four Winds the stand-out. Whoever does the incidental dialog deserves a bonus, too. Arguably the best part of every Living Story update has been the bit where you hang around before and after the action and listen to the characters bantering with each other. If you want to know what's going on, some pro-active talking to NPCs on your part is advised, too. I spoke to all the actors in our current drama as they idle on the blasted heath in Kessex Hills and learned a lot. Most of it probably came up already, but in the hurly-burly of chasing achievements and trying to stay alive it's all too easy to miss a few lines of dialog. Luckily I have two accounts so if I think I've missed a key plot point I can take another run at it, but I have to notice I missed it in the first place. I hadn't really appreciated the degree to which the three Orders, Vigil, Whispers and Priory, were now involved in the battle against Scarlet. I didn't realize Lady Kasmeer was in training as Marjory's assistant (nobility appears to operate under very different rules in Kryta). I certainly hadn't appreciated that when the Asura let Scarlet study at all three Colleges it was because they thought they were studying her. Ah yes. In the end it all comes back to Scarlet and that is a problem. Having a central villain who elicits a first response of "FFS not her again!" is going to cause difficulties in any narrative form. ANet like to compare the Living Story to a TV series but if your audience's instinctive reaction when your main villain appears on screen is to flip to another channel you're going to struggle to keep them coming back for future episodes. My feeling is that where Scarlet is concerned the damage has already been done. No matter how epic the finale, no matter how neatly the loose ends are tied, no matter how satisfying the conclusion, too many people just flat out can't stand her. She's unlikely to be forgiven past indiscretions just because she bows out with one hell of a fireworks show. In any case, I'd be very surprised indeed to find the whole thing wrapped up prettily with all the bows tied. It's been a rag-tag, kick and hope affair thus far and I fully expect to go into next Spring not all that much wiser about what was going on or why it mattered. All in all, the Living Story Season 1 has had its ups and downs. Bits of it have been fun and the bits that haven't have been easy enough to ignore. Whatever follows it is going to need to do better. TESO launches just a month after the final episode of the Scarlet story arc. WildStar must be getting close to pressing the Go button, too. And there's a WoW expansion coming, most likely before the end of Summer. This year GW2 had things relatively easy. Next year could be tougher. Competition is supposed to be the friend of both quality and value. Let's hope so. J3w3l has some trailers for forthcoming attractions up, along with her second take on WildStar. That, along with both her and Keen's enthusiastic responses to the latest EQ Landmark promo (may as well embed it - everyone else has...) got me thinking about what we have to look forward to for 2014 in MMO Land. Off the top of my head I could think of WildStar, EQLandmark, The Elder Scrolls Online and... well that was it, really. Come on, there must be more than that. Maybe it's my memory failing. That age thing again. Remembering stuff, though, that's so 20th Century. We have machines to do that for us now. So I googled "mmo 2014 releases". Top Free MMORPG.net offers Star Citizen (don't care, won't play, won't be out in 2014 anyway), EQNext (care so much it hurts, will play unless dead, don't believe it will be out until the very end of 2014 at the earliest), Titan (yeah, right), PK Project (um, excuse me? ), Lineage Eternal:Twilight Resistance (not quite clear what this is but I've successfully managed to avoid the Lineage franchise for the last decade and a half...) and World of Darkness (now you're just being silly). I won't go through all the rest of their, um, idiosyncratic list, although it did remind me that The Crew, despite being delayed, is due out next summer. Not all that interested in the gameplay on that one but the prospect of being able to take a virtual road trip across the continental United States has a certain appeal. Games Radar has a very slick slideshow that includes the usual suspects but throws in some marginally interesting possibilities like the two hyper-realistic South Korean offerings, Bless and Blade and Soul, neither of which appears to have any kind of Western release scheduled. They also name-check Black Desert, which I was interested in briefly but am no longer and Otherland, in which I was very interested indeed but which I was sure had been cancelled. On checking it appears that, weirdly, the Gamigo website is still up although the latest news refers to the closed beta from over a year ago. I'm pretty sure it's dead. Other than that the Games Radar list offers a smattering of funded Kickstarter projects like Embers of Caerus, Pathfinder and City of Titans, all of which are nominally interesting but won't see daylight in 2014. Ten Ton Hammer includes both EQNext and Pathfinder in its Top Six Sandbox MMOs To Watch In 2014, a list which intriguingly includes TESO, which I hadn't realized was supposed to be a sandbox, along with a previous hot tip now fading fast, ArcheAge. 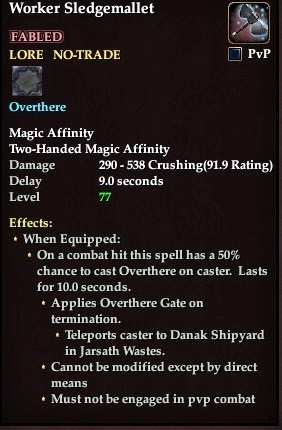 Mention of that one reminded me of Trion's other iron in the fire for next year, Trove. They're both games I'm moderately interested to take a look at but I can't say either is stoking any great fires. Massively has a round-robin of staff picks for next year that doesn't really shed much light on anything other than the predilections of the individuals involved but the paucity of suggestions on offer does serve to back up my own feeling that 2014 is going to be a really thin year for MMOs. Not having played Halo and not having much interest in space-based games, Destiny, one of the few MMOs the Massively crew add to the pile, doesn't press any of my buttons. Neither doesTUG, yet another of the seemingly endless spawn of Kickstarter-funded sandbox titles. So back we come around to where we started. I'll try most any MMO for flavor and in our brave new world of open betas, free to play and try-before-you-buy there's no reason not to give any or all of them a run. Curiosity and the potential for getting a blog post out of the experience almost ensures I'll try all of them at some point but I'm not actually looking forward to playing any of them. I don't even have the same sense of excitement and expectation for EQ Landmark that I had for, say, GW2 or The Secret World back in 2012. I'm interested in in it, sure, but I can't help thinking it looks like work. No, it's EQNext I really want to play. And that, I think, is the heart of the problem. Everything else is just marking time until EQNext, which probably won't be out until 2015. Next year is looking like another year of more of the same - GW2, EQ2, all the old favorites - unless, as I very much wish it might, one or more of the MMOs on these lacklustre lists manages to pounce on me and sink its fangs in deep. Failing that, anyone have any other good tips for 2014? The graphics, already excellent for a browser game, seem to have been polished up even further. I also noticed a number of significant improvements in the UI. Seemed smoother, tidier, less cluttered. Player names turn off. Hooray! Still no "Hide UI" button that I could find. Boo! They changed the music. It's still lovely but I miss the old tunes. Tune really. There was only one but it was a good one. Maybe it turns up further in. I hope so. Character creation's streamlined to perfection. Looks great, takes no time at all. Very clear. Once past that, the opening Fall of Denton sequence has been heavily pruned and is much, much better for it. All the good bits, the atmosphere, the lore and background color, the delightful cut-scenes - still there. The deadweight and repetition - all gone. The whole extended tutorial whips by in just a few minutes. I've done it in far more iterations than I can remember but I think this is the best version so far. Perhaps they'll keep it. ...the Cellar under my house leads to Heaven! Well, Arkadia but it looks like Heaven, if Heaven has cogs. It appears to be some kind of hub zone with all the facilities, including Fishing and Mining mini-games that I didn't quite understand on a first run. But, hey, fishing! Visually the whole area is positively spectacular. Also bright, airy and sunny. What with that and all the flowers in Refuge the whole tone of the early game feels lighter, more positive. You get a vehicle as soon as you arrive in your house. Free! Okay, it's a wonky dirt bike but the Guide Toiler in Arkadia, a robot with some kind of 80s shoulder-pad fetish, runs you through some upgrade and crafting routines to improve it. Upgrading your vehicle's now a thing. Plenty of people there taking in the new sights. It was busy, really busy. Then again, so it was last time it launched. Keeping people around's the trick. This time, though, there were GMs in chat. Chatting. Reminded me of Fallen Earth, that. Also lots of events flagging up. No idea what those are yet. Perhaps most importantly of all, the whole of the opening part of the game now has the feel of an MMO. 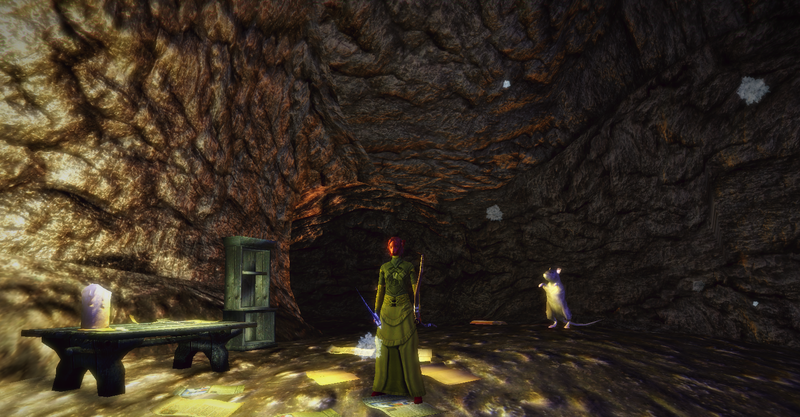 All the tutorial instances I did were effectively open dungeons, albeit very small ones. Huge improvement, although I saw a couple of complaints on the forums from people who prefer to adventure alone at all times. My very uninformed first-look impression; seems like a much-improved offering. It feels very different to the gritty, bleak world that so impressed me way back at the beginning but it's none the less intriguing and for once it feels like it might have heft, traction. We'll see. I'll certainly be playing on. It's over at last. The journey that began back in Antonica all those weeks ago, when Firiona Vie, Leader of the High Elves, Chosen of Tunare and Norrath's sweetheart fell suddenly and inexplicably dead at my feet, ended today in battle with a god; Drinal, The Silver Reaper. Okay, he's not one of the better-known gods. And my part in the fight was mostly trying not to get agro while my new partner, Oligar of the Dead, took all the hits. And anyway we only had to fight him for a short while, softening him up just a little before I stuck him with the bizarrely-named "Soul Skiver" and brought him to his senses. Still and all...a god! The whole affair has been a farrago of nonsense from start to finish but I've thoroughly enjoyed it, not so much in spite of the fact that none of it makes any sense as because of it. This is Norrath! Our Lore never makes any sense! We wouldn't have it any other way. Hey! Watch where you're swinging that thing! Zubon observed recently that going back to traditional questing after playing a more modern MMO like GW2 "is like driving a car with a hand-crank starter". I've never actually started a car with a hand-crank (I wonder if Zubon has?) and I struggled a bit with the analogy but I think he meant that you have to keep re-starting the process yourself - if you don't then the narrative just sits there, going nowhere. 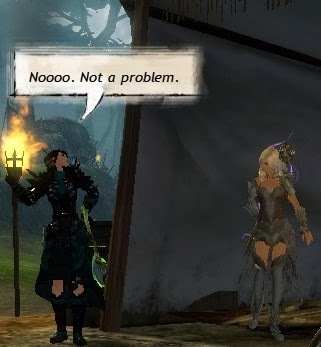 Coming into GW2's series of beta weekends back in the Spring of '12, I was on the verge of burnout with traditional MMO questing. I'd lost patience with lazy NPCs standing on street corners asking me to do their dirty work for them. It seemed very refreshing to have them run up to me in a panic instead, yelling blue murder about something awful that I could actually see happening right now, right there. A year and change later and it's the frenzy of the Dynamic Event and the Living World that seem enervating. Being able to dictate the pace, to accept each task in my own time and take as long as I want about getting the job done seems positively relaxing in comparison. But, but... I'm a pirate too! There seems to be something of a drift back to the traditional quest-driven MMO of late, at least in the corner of the blogosphere I frequent. Kaozz and J3w3l are questing away in Rift. Wilhelm and Stargrace are back in WoW. Even SynCaine dusted off his questing hat for another run at Baldur's Gate, although of course that's not an MMO. Ah, there's the nub of it. 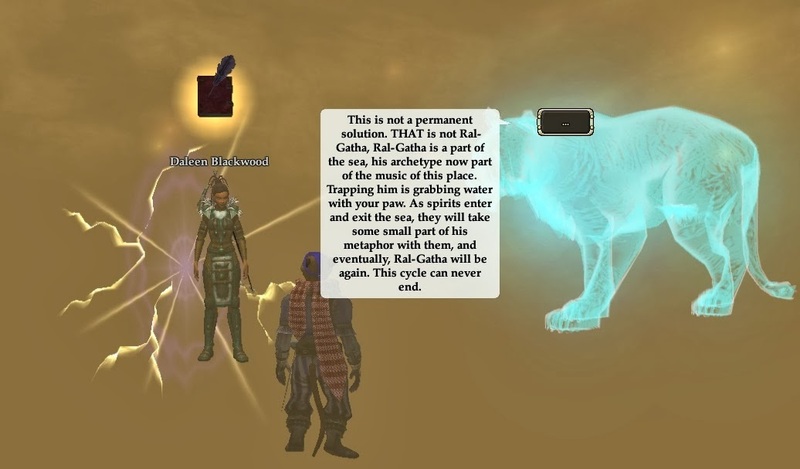 How much, really, does what I've been doing in EQ2 lately have to do with MMOs as we used to know them? A few weeks back, when I was goblining it up in WoW, I mentioned that the starter area felt like I was in my own private instance. All the bloggers linked above allude at various times to the solitary nature of their questing, the difficulty of synchronizing quests with others due to phasing, instancing or lack of quest-sharing mechanics and the extreme soloabilty of quest content. My time in EQ2's Chains of Eternity expansion hasn't felt entirely isolated. There has always been a smattering of other players swooping down on their griffons and flying horses to use the bank in Cardin Ward or grab quest from a nearby NPC. A few times I've even needed to move on to another quest for a while to let someone "play through". In essence, though, completing this very lengthy quest sequence, well over 150 quests in total, has felt much more like playing a single-player RPG than an MMO. And I don't play single-player RPGs. Haven't for many, many years. Why, then, am I eagerly consuming the exact same kind of content here? Two reasons; Person and Place. Person comes in the form of my characters. The overarching motivator of MMOs is probably character progression, which requires a couple of things to work: a character in which you are sufficiently invested to put in the time and some clear progress there to be made. The Chains of Eternity content ticks both those boxes with confidence. I love my EQ2 characters. It's a strong word but it's the right one. I made them, I care about them, I feel a responsibility toward them. Every time I help one to become more powerful, more skilled, more rounded as an individual it feels satisfying. Moreover, because the worlds they inhabit change whether or not I am there, even though my characters remain in stasis while they go unplayed, things may still have happened to them. That's something you just don't get offline. Yesterday I patched up LotRO and logged in my Guardian; several minutes-worth of trait updates flashed solemnly across the screen, after which I chose and specified a new Trait Tree for him. I had no intention of playing him, then or probably ever again but I knew he'd change and grow if I logged him in and I knew he'd want that. Or, if you prefer less metaphysics in your gaming, I knew I wanted it for him. Dreary? I beg to differ. I can think of worse places to spend the afterlife. That done, I Iogged out. Although I have a few characters there for whom I retain some affection, LotRO is not one of my favorite MMOs. Unlike for many, the faithful Tolkein setting doesn't engender any particularly strong feelings of recognition or familiarity in me. I like Lord of the Rings well enough but I'm hardly a fan. I am a fan of Norrath. Very much so. 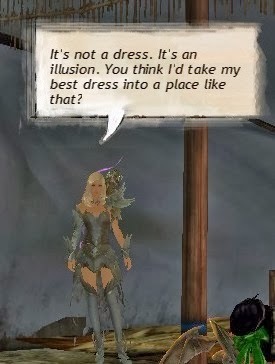 That second reason to keep plugging through the quests, absent in Middle Earth, is very much present in EQ2. A sense of Place. It might seem like laziness or parsimony to base new zones on the architecture of old ones but in my experience it almost always works. The Eidolon Jungle and Obol Plains are versions of The Feerrott and Loping plains respectively. I've spent an inordinate amount of time in both the originals and traveling through these odd, hallucinatory revisions of old, familiar haunts has been fascinating. It's nostalgia and novelty all rolled into one. If Jenni was a predictable surprise, what to make of Fabian? I don't believe Fabian the Bard even makes a walk-on appearance in EQ2. He must have died centuries before the Shattering. Yet here he is, sitting on a log ruing the broken strings of his lute. As in life, so in the Ethernere. This is the kind of context you can only acquire through time. 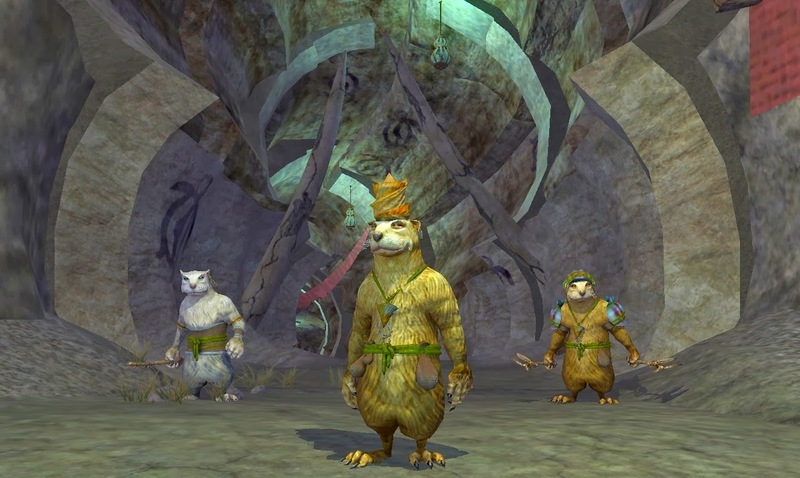 No new MMO can ever arrive freshly-minted and thrilling yet hope to score such easy hits simply by mentioning a name and playing a riff on an old quest that should have long been forgotten but somehow still sets a whole line of bells jingling merrily away. This, when we get right down to it, is why talk of a new expansion has people patching up old favorites and why it's so much easier to get excited for EQNext than WildStar. In the long PR build-up before the launch of an MMO the quantity and quality of information coming out of the company making it may vary but usually it follows a definite narrative. We are making this type of game. It has this type of content. You can expect this type of gameplay. Companies take various stances on inclusivity and collectivism during those long months and years when there are no customers to satisfy, only curious potential purchasers and pre-sold fans. 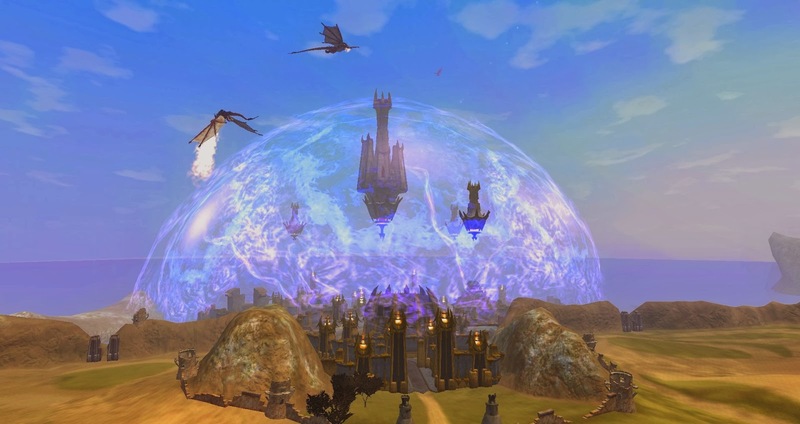 ArenaNet chose to release a seemingly endless series of "Reveals" while the EQNext team is running what appears to be an open-ended series of discussions with "the community" on just about every aspect of their upcoming flagship franchise release. Currently they're highlighting Lore. They already ran a poll on it and followed that up with one of those mildly uncomfortable PR videos that most game companies seem to insist upon doing, where a couple of guys who look like they'd probably rather be getting on with their real work do their best to emulate the co-hosts on a regional TV show that goes out in an unpopular time-slot. Omeed Dariani and Steve Danuser, well-known to the EQ community in particular and the blogosphere in general as Moorgard, do a better-than-average job keeping the conversational ball in the air. It's an entertaining-enough watch as these things go but in the end I'm not sure how much wiser we are about the precise mechanics by which Lore will be disseminated in the next iteration of Norrath. If I had to guess I'd say it won't look that much different in practice to GW2's "Dynamic Events" system. The part where they discuss the various potential outcomes arising from Orcs attacking a village sounds eerily similar to ArenaNet's famous pre-launch "Manifesto" only with Orcs instead of Centaurs. Get to know that face. You'll be seeing it again. That's not to be cynical. It's a given that almost everyone involved in the complex enterprise of making of these entertainments wants everything to turn out just as well as it can. 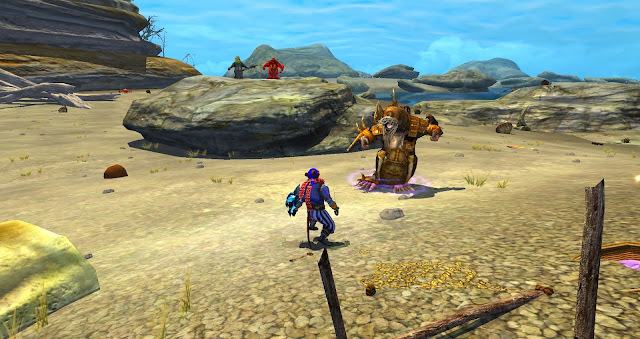 Experience suggests, however, that, when it comes to making MMOs, reach all too often exceeds grasp. GW2 turned out to be a magnificent failure in many ways. A huge, sprawling, living world that should have continued to grow and change by day and by week ever after but simply...stopped. A year and more later the same centaurs burn the same villages as the same villagers shout the same lines even though there's no longer anyone there to listen. Meanwhile odd, fractured, half-baked tales are told badly in secure corners instanced safely away from the world, popping up like mushrooms to be gathered, consumed and forgotten. Scarlet's return as the instigator of the Thaumonova Reactor Meltdown hasn't gone down well. If ANet were to run a popularity contest between Trahearne, Logan Thackeray and Scarlet, Scarlet would probably come in fourth. There are a lot of reasons to dislike her, from her derivative personality and nonsensical backstory to her annoying catchphrases and irritating voice. I find the catchphrases amusing and the voice acting entertaining myself, but it's a minority view. Instead, I share the objections of the commenter on the pithily-titled forum thread Scarlet Hate " who observed "She can basically pull what she needs from thin air, in no time and deploy it instantly, without anyone noticing. It would not be out of her apparent remit to simply make lions arch city vanish into thin air." There's a theory going around that she's behind the mysterious sizzling pillars that popped up overnight all across Tyria. Apparently they extend even into the previously untouchable realms of Orr, thought for practical reasons at least to lie outside the remit of the Living Story. Her dire hand has already been felt across the Mists, where the pillars have been received with a little more equanimity than the universal loathing which greeted the incursion of her Toxic Alliance across the borderlands. In the face of widespread, if not unanimous, disapproval, much like the character herself the Scarlet storyline endures. Still, there is hope yet for her haters. ArenaNet move as though behind a veil, mysteriously. Things once forbidden become ordained. 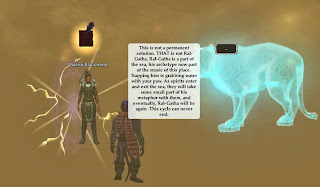 When World Versus World received its own, separate progression path complete with its own, discrete pool of experience points, its own titles and ranks and traits, ArenaNet chose to tie all progression strictly to characters rather than to accounts. I rather liked the decision but again that put me in a tiny minority. Since launch WvW had been, nominally, a character-based activity but the sheer lack of any practical purpose to WvW beyond server pride and the fun of fighting other players made that easy to ignore. 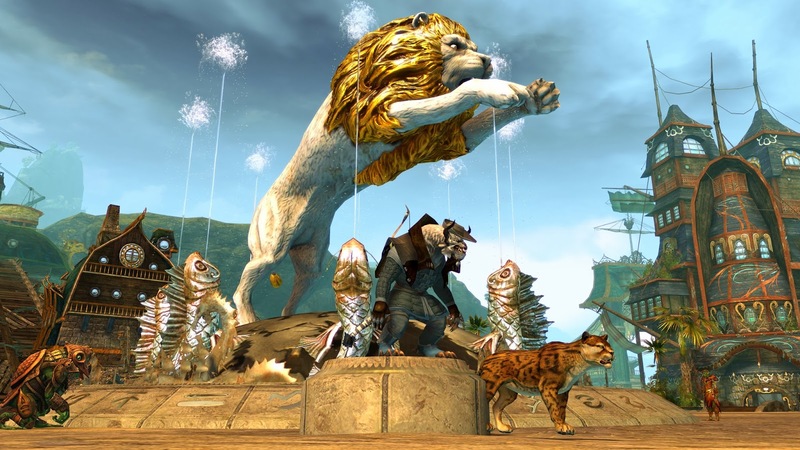 The arrival of points and prizes led many people to feel they had no choice but to concentrate on a single character for WvW. It was the death of Alts. "We never said we couldn’t do it. We said we weren’t going to do it. There is a large difference between things that we decide to do for design reasons and thing that are technical constraints." So true. And so unhelpful, begging as it does the question of why a "design decision" taken a few months ago and rigidly adhered to ever since was the right one then but is the right one no longer. On we roll. At some yet unspecified date in the future all our characters will gain the benefits of the work done by their account-mates. Another step away from the origins and, as some would have it, meaning of the genre but a large stride towards making the game into something closer to what most people appear to want it to be. By the same token we might wake up any day and find Scarlet fell down a hole and can't get up. EQNext is the only upcoming MMO for which I have any real, meaningful, emotional feeling. Landmark is...I don't know what it is. Everything else is a curiosity at best. I'm certain-sure I'll play EQNext. I'd lay very long odds I'll enjoy it. Do I expect it to live up to expectations, either mine or those of the people making it?